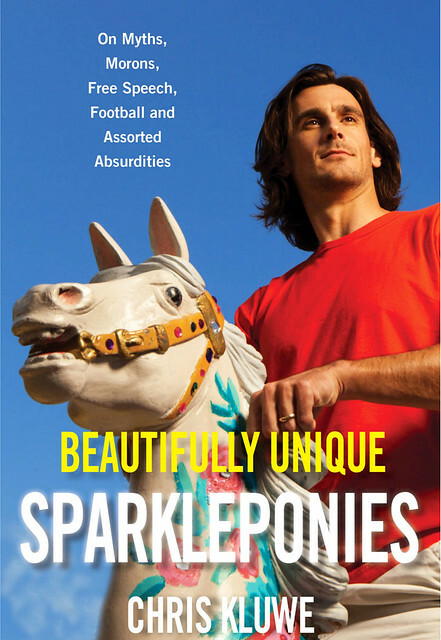 Chris Kluwe kicks footballs for a living, which is nice work if you can get it, and also ponders life, the universe and everything a whole lot. He additionally has a fine knack for writing things on subjects that apparently people don’t expect NFL punters to be able to think cogently about, which is their problem, not his. He does it with flair (and creative cursing). Some of those things show up in Kluwe’s debut collection, Beautifully Unique Sparkleponies, which Chris sent to me early, and which I enjoyed the heck out of. I even gave it this quote on Twitter: “Chris writes much better than I can punt.” I don’t know if they used it. I’m pretty sure, in fact, that they did not. Bastards. Anyway, here’s Chris. Anyways, as someone who is a huge sci-fi fan (and human rights fan), I wanted to send a copy of my book to Scalzi, and he responded most graciously by reading it and asking me to write a Big Idea piece. Sparkleponies is a collection of short stories and essays covering a wide variety of topics, hopefully in an entertaining and educational way (I promise you’ll learn some new swear words at the very least). I frequently describe it as a snapshot into my mind, and the main reason I wrote it as such is because I wanted to show you can’t define a human being with just one label. You, as a person, summed up in the label of someone else’s narrow definition. This is an utter failure to think, a failure to use your brain for something more than keeping your ears apart (as my mother loves to say). Trying to distill a human being, a complex summation of millions of different experiences, into one easily recognizable slogan or catchphrase, is antithetical to the society I want to live in. I want to live in a world where people are celebrated for their differences, for their complexity, for their uniqueness, for the widely varied things that make them who they are. I want to live in a world that realizes your job does not define you as a person. I want to live in a world where I can be a football player, a video game nerd, a sci-fi/fantasy geek, an author, a husband and father and brother – all at the same time, because that’s who I am. Above all, I want to live in a world where people are empathetic enough to understand that we’re not all going to be the same (and that’s okay! ), but the only way I have the freedom to live my own life is if everyone else enjoys that same freedom in return. I am not a label, I am a multifaceted creature, just like all the other human beings on this planet, and we all deserve the recognition and ability to make our own choices in life. This doesn’t work without empathy, though, because you have to realize how to see people as more than just a label, how to put yourself in their shoes. Empathy is a big part of Sparkleponies, because it’s also my belief (as a history and political science major) that societies that don’t practice rational empathy inevitably collapse – either by fomenting conflict from within by oppressing a segment/s of their populace, or seeking conflict from without by taking from others and eventually getting into a fight they can’t win. Civilization has a 100% failure rate in the historical record, and that leads to my second Big Idea in the book. If, as a species, we don’t understand how to value long term consequences over short term gains, then we will go the way of the dodo and the dinosaur. A lot of the pieces in Sparkleponies deal with the concept of long term thinking and planning, of looking past your own lifetime to the many other lifetimes that will exist once you’re gone, because if we don’t learn how to look past ourselves, we won’t be able to deal with certain events that crop up on the geologic timescale with alarming regularity. Things like, oh, say, asteroid strikes. Global climate changes. Supervolcano eruptions. Toxic pathogens. And that’s not even getting into what we can do to each other if we don’t understand why pushing that red button is a bad idea. Sure, these probably won’t happen in our lifetime. We should be safe. But they will happen eventually, I can promise you that, and if we as a species don’t understand how to get off this rock, well, I guess we had a good run. We’ll be a brief flash on some alien astronomer’s telescope, our bones a curiosity to our cockroach successors. Except I don’t want to live in a world with the mindset of “Oh well, I got mine, everyone else can get fucked” that dies off a couple millennia from now. I want to live in a world where we get out to the stars (even if I never live to see it), a world where we explore our galaxy and all the other galaxies in the universe (even if I never live to see it), a world where we understand the beauty that there’s much out there we don’t know, and probably never will, but it doesn’t stop us from constantly searching for answers. The only way anyone will ever get to see that world, that science fiction dream we all dream, is if we understand that we have to work together, we have to create a stable society that can stand the test of time, and in order to do so, we have to always consider what consequences will result from our actions. We have to value education and rational thought over entertainment and knee-jerk impulses, otherwise we’re spiraling down that same path every other civilization before us walked. We also need to not overuse commas, that’s important too, which is perhaps the Biggest Idea of the book. We’re all we have in a universe doing its level best to kill us every second of our existence. Take a step back and laugh every once in a while. You’ll feel much better about yourself, trust me. I’m on a horse. Read an excerpt (via NPR). Visit the book page (which also features an excerpt). Follow the author on Twitter.